Mr Quimby's Beard - "s/t"
Mr Quimby's Beard has finally made available on CDR their first album which had been a cassette only release in 1994. Occupying an area somewhere between heavy Hawkwind and early Pink Floyd, the band combines rocking guitars, soaring keyboards, bubbling space synths, and intense vocals and lyrics to create what I consider to be some of spacerock's greatest songs. Songs like Within The Mind Parts 1 & 2 include trippy guitars, flowing keyboards, and an organ that gives the music a 60's psychedelic sound. Part 1 is the instrumental intro and Part 2 is the vocal song. It's more on the purely psychedelic side than most Quimby music but the heavier elements are still there. But man, I love that organ. "Laugh In Ya Face" is another song that features this great organ sound and with the guitar makes a potent combo. "D-Jam" is the same song that was eventually included on the band's Definitive Unsolved Mysteries Of album. The later version is a much more potent rocker, though I think this one is more dark and intense, just as this album as a whole is. "Stoned Premonition" and "Mossy" are short but effective songs that have a great space guitar sound. Don't ask me why, but "Stoned Premonition" strikes me as spacerock James Bond music. It's got totally tripped out wah'd guitar, chanting vocals, and layers of bubbling synths. And "Mossy" is a cool easy-paced rocker with more cosmic guitar melodies. And then... and then... there's "Marijuana Nightmare" and "The Forest Song"! Ok... I have to force myself to keep this one simple or I'll go on all day. Suffice it to say these are great tunes, with "Marijuana Nightmare" being a true spacerock classic. This tune rocks like rolling thunder, creating a dark atmosphere punctuated by swirling synths, a heavy symphonic keyboard backdrop, driving rhythms, and some of the most intense vocals I've ever heard. And if "Marijuana Nightmare" has some of the most intense vocals I've ever heard then "The Forest Song" has some of the most frightening. I think Hardy once told me they don't perform this live much because the singer ends up coughing up blood. I can hear why that might happen. But it's a great rockin' tune that isn't easily forgotten. In summary, Mr Quimby's Beard is essential to any spacerocker's collection. If you liked The Definitive Unsolved Mysteries Of, then you'll want to jump on this one as well. My number one choice for the band I must see perform live. 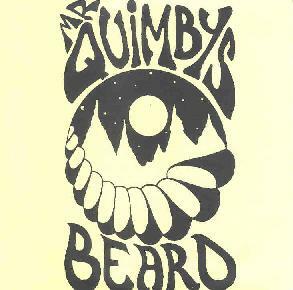 You can visit Mr Quimby's Beard at the Freaki Fungi web site. While there you can listen to this ENTIRE album online in RealAudio. Contact via snail mail at Freaki Fungi; 3 Sussex St; Silksworth; Sunderland; Tyne & Wear; SR3 1BY; UK.